2017 Bayliner Element XR7 2017 Bayliner Element XR7 NEW 2017 BAYLINER ELEMENT XR7 DECK BOAT! 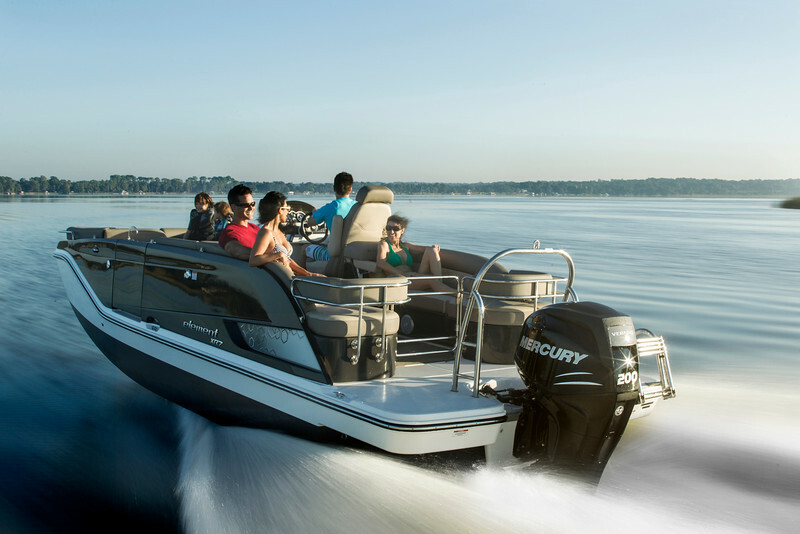 A 200 hp Mercury Verado 4-stroke EFI outboard with a Mercury Enertia stainless prop and a 3-year factory warranty powers this loaded fiberglass deckboat. 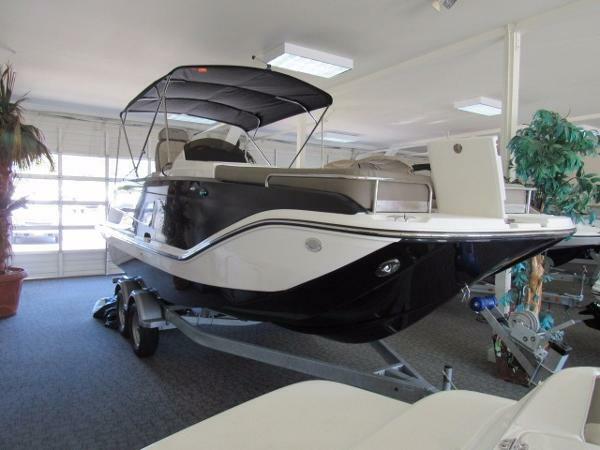 Optional equipment includes: factory mooring cover, stainless steel upgrade package, luxury high back swivel reclining captains chair w/armrests and slider, recessed docking lights, snap-in Seagrass flooring, stainless ski/tow bar, digital depth gauge, and bow 4-step telescoping boarding ladder. 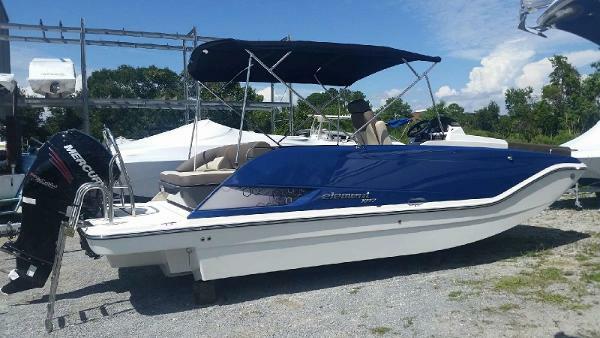 Features include: bimini top w/boot, fiberglass helm w/enclosed changing room, gauges include; tachometer, speedometer, fuel, trim, and voltmeter; Jensen AM/FM bluetooth stereo w/AUX-USB ports, tilt steering wheel, courtesy lights, navigation/anchor lights, electric horn, interior lights, bilge pump, blower, circuit breakers, 12-volt power outlet, bow swim deck w/4-step telescoping boarding ladder, bow anchor locker, bow port and starboard stainless hand rails, port and starboard bow layback couches w/under seat storage, portside entertainment station, port side companion seat, stern port and starboard layback couches w/under storage and flip-up armrests, fiberglass non-slip floor, fiberglass non-slip swim platform w/4-step telescoping boarding ladder, in-floor ski/board storage, beverage holders, (6) stainless mooring cleats, fire extinguisher, marine cranking battery, on/off battery switch, 40-gallon fuel tank, 16-person carrying capacity, and limited lifetime hull warranty. Also included is a Karavan tandem axle bunk trailer including; surge disc brakes, 15 wheels, LED lighting, tie-down straps, bearing buddies, composite fenders w/steps, and swivel jack. Trades will be considered and delivery is available. Competitive financing rates and terms are also available. Approximate payment is $472/mo. for 144 mo. with 20% down (WAC). Leaders RPM is one of the largest marine and powersports dealers in the Midwest with over 70,000 sq ft of showroom, parts, and service under one roof located in Kalamazoo, MI. Price is plus freight, prep, sales tax/fees and is subject to change without notice. All rebates to dealer. 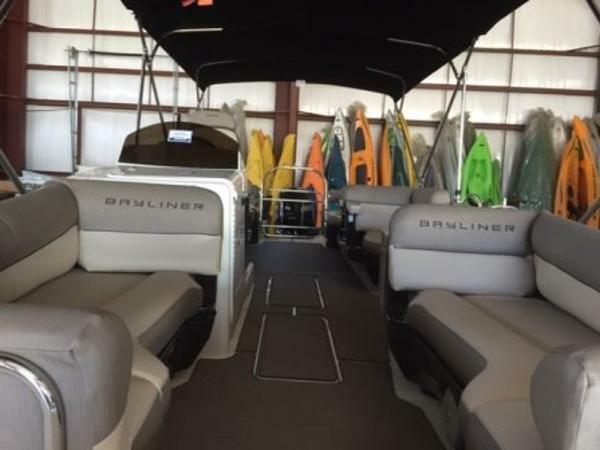 2016 Bayliner Element XR7 We took the comfort and room of a pontoon boat and gave it a more evolved look. Then replaced the pontoons with our patent-pending M-Hull™ running surface. The result: Bayliner's evolutionary Element XR7. The new measure of what a recreational boat can (and should) be. 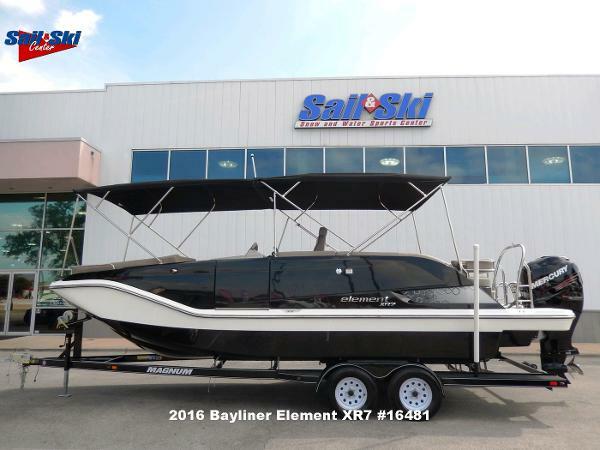 2017 Bayliner Element XR7 This XR7 is Blue and has the Mercury L6 Verado 225. 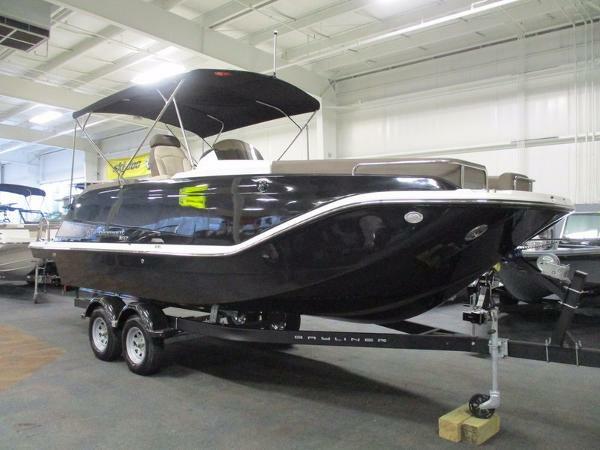 It is a great boat here for the Lowcountry because it gives you all the room and comfort of a pontoon on a fiberglass hull that's suitable for big water. With seating for 16, there's plenty of room to take everyone out for the day. 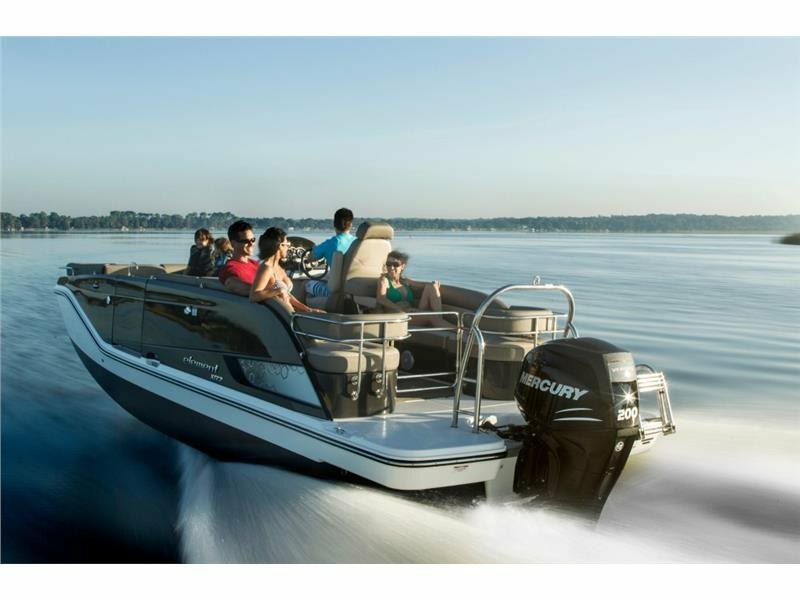 The upgraded Mercury L6 200 Verado makes this boat move quickly out there on the water. Options include but not limited to stainless steel upgrade, L-group seating, mooring cover, lighting package and ski tow bar. Add $4,900 for custom aluminum black wrapped trailer with torsion axles. 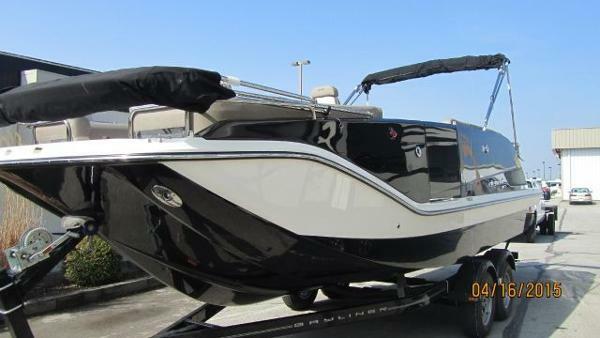 Bayliner took the comfort and room of a pontoon boat and gave it a more evolved look. Then replaced the pontoons with the patent-pending M-Hull running surface. 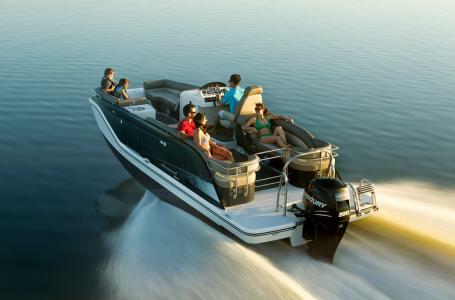 The result: Bayliner's evolutionary Element XR7. It combines comfort, space, style and performance like never before. 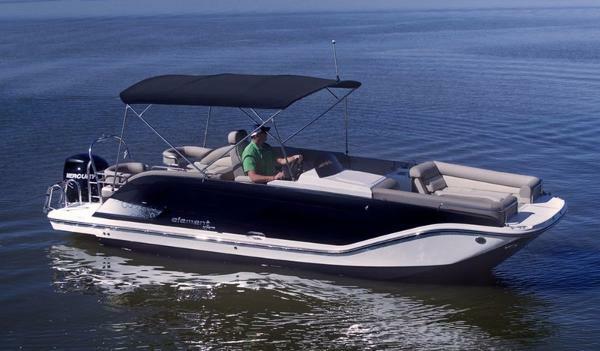 The Element XR7; the new measure of what a recreational boat can (and should) be, especially for big water environments where you'd never take a pontoon. 2017 Bayliner Element XR7 We took the comfort and room of a pontoon boat and gave it a more evolved look. Then replaced the pontoons with our patent-pending M-Hull running surface. The result: Bayliner's evolutionary Element XR7. It combines comfort, space, style and performance like never before. Key Features Spacious deck layout with plush, premium-upholstered lounges forward and aft, companion and captain's helm seat. Deep freeboard and high gunnels keep passengers and gear secure with outstanding capacity for up to 16 passengers. Patent pending M-hull design dramatically improves stability while on plane and maintains tracking throughout turns. Ideal for rough or calm water in salt or fresh water environments. An ideal, trailerable, all-water boat. Reliable Mercury® outboard power. Standard power is a 150 FourStroke outboard with 200 HP Verado® optional offering. Easy operation for seasoned and beginner boaters alike. Enclosed head compartment forward of helm station and ample, in-floor storage standard. Sturdy forward and aft folding beach/boarding ladders and port side boarding gate. 2017 Bayliner Element XR7 The comfort and room of a pontoon boat, a more evolved look, replacing the pontoons with Bayliner's patent-pending M-Hull running surface. The result: Bayliner's evolutionary Element XR7. 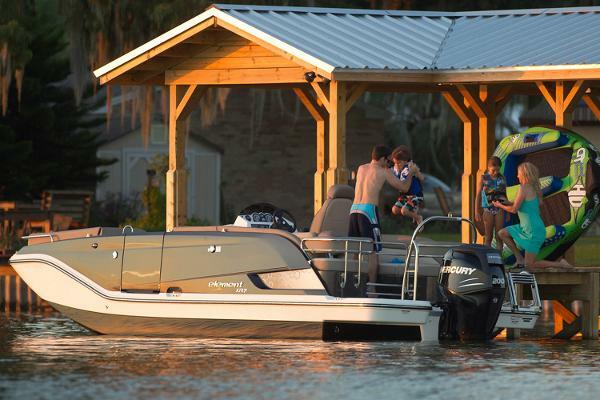 The new measure of what a recreational boat can (and should) be. Stop by and check out the evolutionary Element XR7! Powered by the Mercury 150 horsepower 4-stroke engine. Great handling for cruising, tubing, and family gathering. In stock and ready for the water. Spacious deck layout with plush, premium-upholstered lounges forward and aft, companion and captains helm seat. Deep freeboard and high gunnels keep passengers and gear secure with outstanding capacity for up to 16 passengers.Patent pending M-hull™ design dramatically improves stability while on plane and maintains tracking throughout turns. Ideal for rough or calm water in salt or fresh water environments. An ideal, trailerable, all-water boat.Reliable Mercury® outboard power. Standard power is a 150 FourStroke outboard with 200 HP Verado® optional offering. Easy operation for seasoned and beginner boaters alike.Enclosed head compartment forward of helm station and ample, in-floor storage standard. Sturdy forward and aft folding beach/boarding ladders and port side boarding gate. 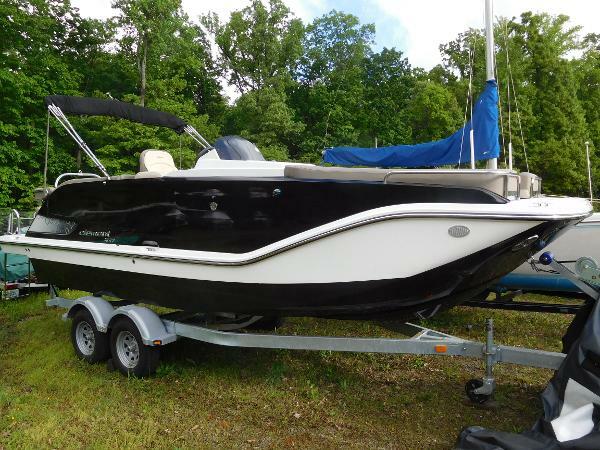 2016 Bayliner Element XR7 2016 Bayliner Element XR7, Mercury 150hp, tandem axle trailer. 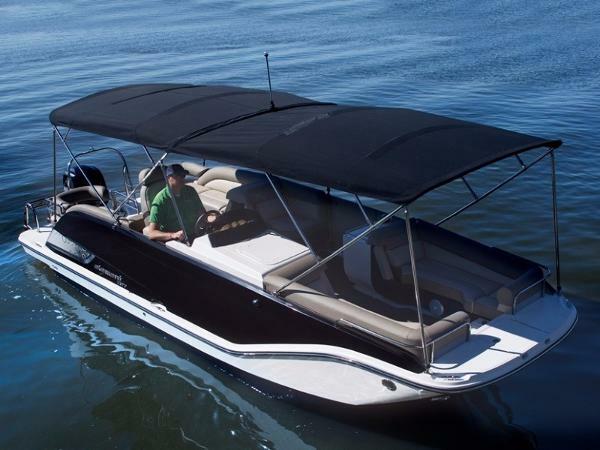 We took the comfort and room of a pontoon boat and gave it a more evolved look. Then replaced the pontoons with our patent-pending M-Hull running surface. The result: Bayliner's evolutionary Element XR7. Key FeaturesSpacious deck layout with plush, premium-upholstered lounges forward and aft, companion and captains helm seat. Deep freeboard and high gunnels keep passengers and gear secure with outstanding capacity for up to 16 passengers.Patent pending M-hull™ design dramatically improves stability while on plane and maintains tracking throughout turns. Ideal for rough or calm water in salt or fresh water environments. An ideal, trailerable, all-water boat.Reliable Mercury® outboard power. Standard power is a 150 FourStroke outboard with 200 HP Verado® optional offering. Easy operation for seasoned and beginner boaters alike.Enclosed head compartment forward of helm station and ample, in-floor storage standard. Sturdy forward and aft folding beach/boarding ladders and port side boarding gate. 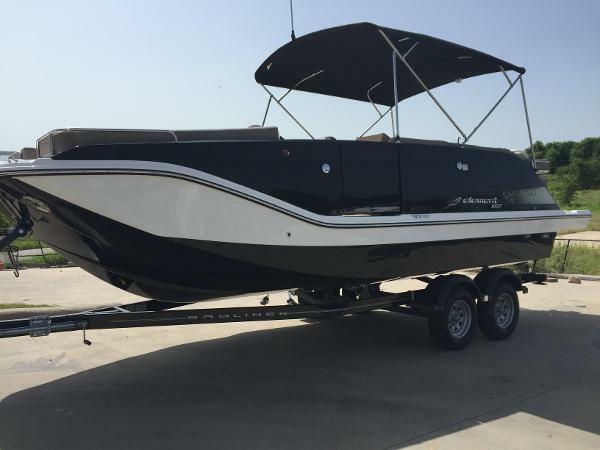 2015 Bayliner Element XR7 2015 Bayliner Element XR7 deck boat w/200hp Mercury Verado, black side panels and hull bottom w/desert sand, preferred equipment package, bow bimini, high back helm seat, depth finder, underwater lights, air compressor, mooring cover, seagrass floor cover, docking lights, drawer style fridge, battery on-shore charger, ski tow bar, lighting package, wet bar w/sing 10 gallon, galvanized swing tongue trailer w/brakes, 40 gallon gas tank.